In a large frying pan or wok, stir-fry the onions, pepper, celery and carrots in hot oil until tender. Add the chilli paste and garlic, followed by the rice, and stir till the mixture turns warm. Add the peas, corn, stock, soya sauce – heat till very hot and season to taste. Fry the onions, lemon grass, ginger and garlic in oil for 10 mins. Stir in the turmeric and coriander, then fry for 1 min. Blend the mixture with the tomatoes and coconut cream to make a purée. Return to the pan with the mango chutney and chilli and reduce for 10 mins or until it reaches a thick paste. Add the prawns to the sauce and cook for a few mins, or until they turn pink. Add the fresh coriander and season with salt, pepper and lime juice.To serve, squeeze lime all over the rice. 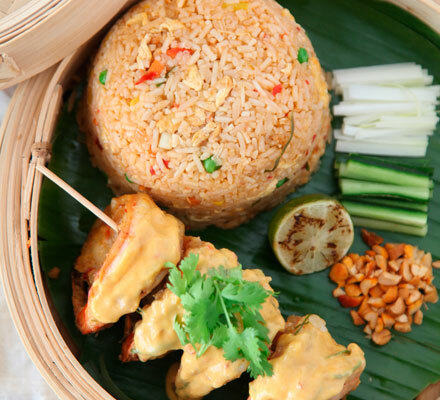 Garnish with peanuts, spring onions, chilli and coriander, and serve with the prawns on the side.